Talking Wolverine Football, Book Writing, Transformers Continuity & Exodus, Part 2! unicron.com: Alex, you're online. Cool! Irvine: Hey Kevin. Normally I hide, but figured we should finally have this conversation, right? unicron.com: Indeed! … So much for getting Jim Harbaugh to coach our Wolverines, huh? Maybe you could have Tom Brady bust a knee, end his career w/ the Pats, and just walk right in to the Ann Arbor job. There's still time! Irvine: Yikes! New England would be plunged into mourning. Les Miles will probably be fine, but I was rooting for Harbaugh to take it, for sure. unicron.com: Sacred job, we need a savior. Hope he can get the job done. I only have 2 more years here and I need a title right away! unicron.com: Yeah, right! Hasn't helped so far! Irvine: Yep. Went to college at UM. Irvine: You know what's funny? I got my MA at UMaine, which also says Go Blue! unicron.com: Nice! They didn't rip off our fight song tho, huh? unicron.com: Alright, so MA in Maine, then how does one break into into the book business? Know people? Start sending your work to 100's of places and then start the prayer vigils? Irvine: A little of both. I started writing short fiction, started publishing it, and that got book editors to take me a little more seriously. Then once I'd published my first book I started getting all kinds of inquiries about tie-in and licensed work. If a project sounds fun and I have time, I'll usually do it. unicron.com: So writing is something you do "on the side" while you're a full time faculty at UMaine? Irvine: Actually I just left UMaine. unicron.com: So, full time writing? Irvine: For the foreseeable future, I'm writing full time. Cowabunga! unicron.com: Nice, pursuing your passion. Create your own hours, be your own boss. Nice gig. Irvine: It does have all those things going for it. But there's also something nice about the certainty of a steady paycheck, especially when you have 3 kids and a mortgage! Wheeeeee! unicron.com: Yeah, I was a happily self-employed business owner for 10 years before going back to school... I know the feeling! So how did the ideas for Exodus come about? Who approached who? Irvine: Exodus came about because Tricia Pasternak at Random House called me up one day and asked me if I wanted to write a Transformers novel. I'd worked with them before on a number of licensed projects, and this one sounded like fun. Then she put me in touch with Michael Kelly and Aaron Archer at Hasbro and we talked story. Then I went and wrote the book. unicron.com: Had you been a fan of Transformers growing up or had you done a TON of research on the subject before you started writing? To derive some of the connections you did, I figured WOW, you had to have some sort of inside connections! Irvine: Some of both. I watched the cartoons, but not obsessively, and I had a few transformers. But I steeped myself in the lore of Cybertron before writing. Also the guys at Hasbro were great. We had long conversations about various parts of the book, but once they had made their point about what they needed continuity-wise, they left me alone to tell the story.I mean wow. unicron.com: Even as a very long longtime fan of Transformers, since day 1, I had to go back and review much of the source material you drew from. Hope you're ready for some nerd questions now! unicron.com: Aerial!, yup. See, you can handle the nerd questions! 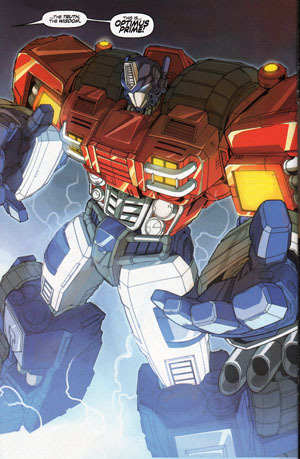 Unicron.com: In War Dawn, Orion Pax worked at an Energon processing station. I had to re-read the War Within (Dreamwave Comics, 2002 series) comics to re-establish the notion of Orion Pax as a Librarian, an archiver of information in the Hall of Records at Iacon! Talk about the decision process about how you pick and choosed what info you utilized and what you didn't. Irvine: much of the initial setup came from Hasbro. They had an idea that OP should be a clerk, and I took it from there, developing the idea that he overhears Megatron's early transmissions and gets interested despite himself. unicron.com: Yeah, that idea, of him as a data clerk came from Simon Furman's "The War Within" comic series. But in there, Furman (unfortunately, IMHO) ignores the "Orion Pax" angle and launches into another story. Irvine: There's a lot of synthesizing of earlier stories going on. That's intentional. Some of the early story was developed in parallel with the War for Cybertron game, but Hasbro didn't hold the book hostage to the game story. unicron.com: With the richness of the lore you incorporate into various parts of the book, I figured that Hasbro or someone that knows a LOT about Transformers must have been involved.Prior to this book, new iterations/generations of Transformers were viewed (by fans and Hasbro) as "reinventions" of the franchise. Less/not connected w/ other generations. Irvine: They were. But like I said, the best thing about that project as a writer was that once they'd laid out the basics of what they wanted continuity-wise, I was free to tell the story.I don't think they're trying to reinvent so much as synthesize new. But that's going to rub some people the wrong way if they have a strong allegiance to a particular continuity. unicron.com: Yeah, well you can't please everybody! Some fans have been begging for is that each new iteration, be viewed as connected to the Transformers continuity that has come before. Each is a new chapter in the eternally long story of Transformers (rather than a complete re-boot/reinvention.) It sounds like a perfect setup. A skilled writer who knows how to tell a great story, connect it w/ all the rich mythology that has come before.It's for all the above reasons that we liked this story so much. unicron.com: Hah, It's true though! It's this kind story many of us have been hoping for for years. Irvine: I think it's a delicate dance in some ways, telling a story that's new and fresh yet still respectful of what came before. Previous stories should inspire but not constrict, you know? unicron.com: I couldn't agree more. And it's difficult to do, considering how much story has been done before! Irvine: Truer words...I'm finding that out even more now that I'm working on the next book. unicron.com: Other examples: Soundwave's "mini-cons" your calling them Mini-cons is a first. Your way of quickly sneaking in an explanation about how/why they can talk w/ a series of beeps and whistles and or through regular spoken language, strangely clears up a lot of confusion and interpretations of various stories involving this third faction/race of bots from Cybertron. Thoughts on this? Irvine: They were referred to as Minicons in some reference material I had from Hasbro, but the language issue was something I made up to patch over those conflicts. I like Minicons. unicron.com: Yeah, Minicons are cool, no doubt. And they're referenced all over in TF-lore. I don't remember Rumble, Frenzy, Laserbeak... eving being called "Mini-cons" but what do I know?! unicron.com: Another example: Network of space bridges to other planets colonized by Cybertronians: Gigantion, Velocitron... --All direct connections to the TF: Cybertron series of 2005. "The Hub" (from G2 comics, TF Collector Club comics and now the Television Network.) as one of the other planets colonized by Transformers! And you say I'm a "smooth talker" ...Look at you writing that in! HA! Irvine: We aims to please! unicron.com: So what can I ask you about the second book?! Is it a continuation of where Exodus left off? Or do we get to go back in time pre-Orion Pax, and learn about the original 13? unicron.com: All that covenant of Primus talk, the "Artifacts" Matrix of Leadership, Prima.... So much to explore!! Irvine: That's for sure! Some of that stuff comes into play in this book too, but perhaps in unexpected ways. Irvine: I deliberately decided to go light on the visuals of familiar characters for exactly that reason. Picking a detailed description seemed a little like starting a fight. unicron.com: Myself, I envision them as their video game selves, sort of a combination of the G1/Bay looks. Irvine: Interesting. Then one of the interesting things to follow was the way some fans wanted much more detailed descriptions. I think they wanted the book to choose sides in the continuity arguments, and I really didn't want to do that. unicron.com: How about this: What if Shockwave does some "spark splitting experiment" on the Darkened Megatron. Then one of the Megatrons can go chase the Allspark and crash land in the arctic. The other spark-half of Megatron can crash land on Earth on board the Ark with the other Autobots and Decepticons. There, now they're both the "real" Megatron! unicron.com: Hahahaha! Let the spontaneous combustion begin! unicron.com: As if in contrast to the less than convincing way the young Anakin Skywalker turns to the Dark Side for seemingly no reason, I really enjoyed the explanation you provide. unicron.com: The "Blood of Unicron" Dark Energon... Still nerd-gasming over that sweetness! Irvine: hahaha! Dark Energon was fun for sure. I kind of want to use it more, but I'm not sure how much of it there is in the universe outside of Cybertron. unicron.com: Was this all your idea or did Hasbro want to get Unicron involved in the story somehow. As a McGuffin, it works well on many levels. 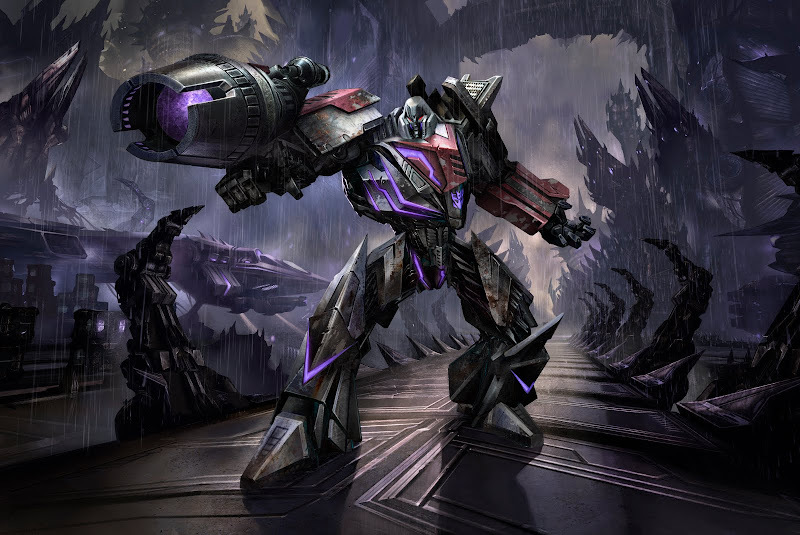 Irvine: Dark Energon was part of the story from the beginning. I made it more addictive and developed its role some as we went along. -you're looking up, who is Unicron, again?! Irvine: "Blood of Unicron" is an interesting formulation. I tried to stay away from organic language in the book. The nature and function of Unicron is still ambiguous, and it should probably stay that way for now...but Dark Energon is definitely from Unicron...(ha--no, that one I remember, but my wife called)"sparks of Unicron" is I think what I called it in the book, or had it referred to that way in the DataNet. unicron.com: Interesting. When you write a book, do you start out writing page one, knowing exactly how it's going to end or do you figure that out as you go along? Irvine: usually you (by which I mean me) start with some idea of how it's going to end, but you have to be alert to better ideas as they come along. Oh yeah! That's someting I wanted to ask you. Another obvious connection that could have been made was instead of calling them Code Key of Justic/honor, why not call them "Cyber Planet Keys!" unicron.com: Sweet! I consider myself an old, new-school fan. Can't wait! Have you finished book 2? Any notion of approximately when it may be available? Irvine: Finishing the draft of it soon. I'm not sure when it's supposed to come out. The obligatory plug. If you dig my Transformers book, take a look at my original stuff. Writers like me love doing licensed work because we're fans, but our careers, in the end, stand or fall on the books we write outside existing properties. If you liked Exodus, you'll like my other stuff. I promise. unicron.com: Cool. I will definitely give it a look. What should I look up first? Irvine: By "you" I meant TF fans in general, but hey, I'm happy if you're first in line... Try Buyout. Near-future crime/SF novel. unicron.com: Alright, it's a deal. Oh, BTW, we should mention, you work on IDW comics! Has there ever been any conversation about making a comic adaptation of Exodus? <sheepish editor's note... At the time of this interview, I was unaware that the K-Mart exclusive "comic" that came with your purchase of the War for Cybertron game. This comic is written by Alex Irvine and Drawn by Don Figueroa, covers roughly the same material as Chapters 12-15 of the book). unicron.com: Awesome! Alright, I'll try to resist the temptation to ask you more. I want to really thank you for your time. It's been a great pleasure, but we both have other stuff we probably ought to get to.Thank you! unicron.com: I bet! Thanks again, and GO BLUE! Irvine: De nada, talk soon. Go Blue!